You’ve heard the lore about breakfast: It’s the most important meal of the day, right? Nutritionist Carrie Dennett digs into the facts. I’m a committed breakfast eater, yet I’m not 100 percent on board with the notion that breakfast is the most important meal of the day. My feelings are partially based on personal experience, because I haven’t always been a breakfast eater. Like many teenagers, I went through a few years of going to school on an empty stomach, and several years ago I gave intermittent fasting a test drive. So, I know that it is possible to skip breakfast and not be ready to eat the paint off the walls by lunchtime. On the other hand, I suspect that missing my morning meal was the reason I kept falling asleep in second-period French class. Nevertheless, my resistance to make blanket statements about “starting the day with a good breakfast” has support from a growing body of research suggesting that people who skip breakfast don’t necessarily overeat later in the day (i.e., eating more calories overall than they would if they had eaten breakfast in the first place). I’m quite familiar with the oft-repeated bit of data from the National Weight Control Registry that eating breakfast is associated with weight loss and maintenance, but I’m not comfortable with the accompanying assumption that eating breakfast leads to successful weight loss. Association is not causation. That point was clarified with a 2013 study that explored the “proposed effect of breakfast on obesity,” aka “PEBO.” The findings? In many research papers that invoked PEBO, researchers improperly used the language that implied skipping breakfast causes weight gain, both when referring to their own research and the research of others. Just because a study shows that breakfast eaters tend to weigh less does not mean it’s because they eat breakfast. This issue came up again recently with the publication of a study that found an association between breakfast skipping and cardiovascular disease. The study, published earlier this month in the Journal of the American College of Cardiology, found that skipping breakfast — having juice or coffee but nothing more — is associated with increased odds of having atherosclerosis of major arteries. Atherosclerosis is the hardening and thickening of arteries due to fatty deposits, or plaque. Say it with me: Association is not causation. In other words, just because two characteristics tend to be present in the same people doesn’t mean that one caused the other. To assess whether breakfast skipping causes atherosclerosis (or any other health problem), you would have to get a large group of people, randomly assign half of them to skip breakfast every day and the other half to eat breakfast every day, then follow them for years, perhaps decades, to see what happens. Trouble is, the breakfast skippers — about 118 people out of the total 4,052 people in the study — were more likely to have a poor diet overall, to smoke and to frequently consume alcohol. But yeah, it must be because of the breakfast skipping (end sarcasm). • Find yourself vulnerable to inhaling break-room doughnuts by 10 a.m.? • Feel so hungry at lunch that you make less-healthy food choices — or end up overeating in an attempt to fill what feels like a bottomless pit in your stomach? • Find that you’re not functioning at your best early in the day — low energy, lack of mental focus, irritable mood? • Need to eat breakfast for medical reasons, such as morning medications that should be paired with food? If one or more of the above pitfalls resonate with you, consider starting a new breakfast habit. Before you say, “But I’m not hungry in the morning,” consider this: If you have long been in the habit of skipping breakfast, your morning hunger signals may have “died.” That doesn’t necessarily mean your body doesn’t need fuel after fasting all night. Resume eating breakfast, starting small if need be, and your hunger signals will likely revive after a while. Already a breakfast eater, but it tends to be high-carb, low protein (pastries, cold cereal, toast with jam)? Switching to a higher protein breakfast — Greek yogurt with fruit and a sprinkling of chopped nuts or granola, scrambled eggs with veggies and a side of whole-grain toast, or simple whole-grain toast with peanut or almond butter — will likely keep you satisfied for longer, in part because your blood sugar isn’t spiking and crashing. Try experimenting with healthy breakfast foods to find the mix of carbohydrates, protein and fat that leaves you feeling energized and satisfied. For example, as much as I love oatmeal, when I have it I get hungry within two hours — and that’s even using steel-cut oatmeal with some nuts mixed in. However, I have some patients who last until lunch on an oatmeal breakfast. One protein-rich, portable option I love? Overnight oatmeal. This is the ultimate nutritious grab-and-go breakfast. If taking it to work (or school), a Mason jar with a plastic lid is extremely handy. The 1/3 cup measurements are a guide; you could do ¼ cup, or ½ cup, depending on your personal needs. 1. 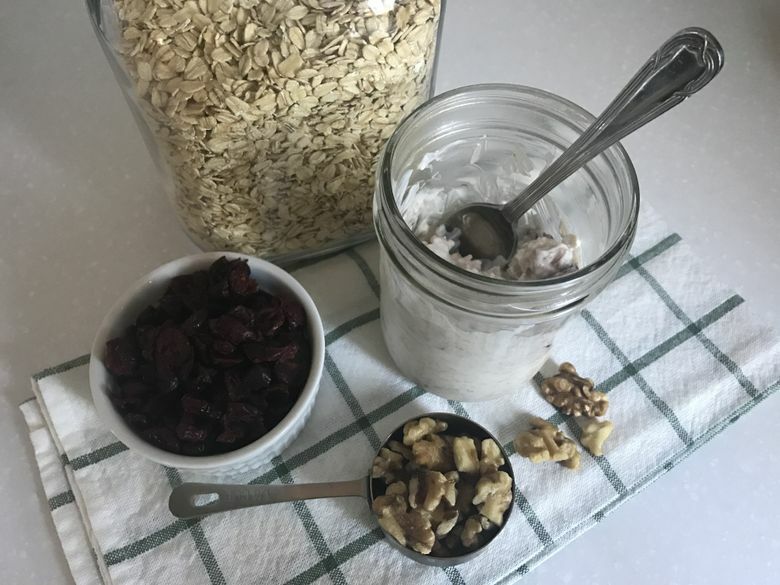 Combine oats, yogurt, milk or kefir, and any optional ingredients you’re using (other than fresh fruit) in a bowl or jar. Stir well, and refrigerate overnight. 2. In the morning, add fresh fruit (if using) and enjoy. Carrie Dennett, MPH, RDN, CD, is a registered dietitian nutritionist at Menu for Change and Nutrition By Carrie. Visit her at nutritionbycarrie.com or follow her on Twitter at @CarrieDennett.